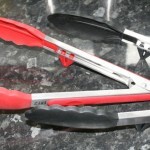 Who would have thought that kitchen tongs for cooking could provoke a review? Well I am rather fussy when it comes to my cooking tongs, I like to have quite a few knocking around in the kitchen at any given time, because when one set is in the dishwasher, I can always rely on the fact I have a few pairs at the ready so I can flip my chops over without having to mess around with a fork or burning my fingers on the grill. Below is the image of a great set of two pairs of Zizi kitchen tongs I recently got for free to review, and as a bonus, an oven mitt was also thrown in for free. I want to look at the key points which I find of use when talking “kitchen tongs”! You may see this as a little bit on the trivial side, but really, without these features tongs just don’t do the job right for me! When cooking, you will more often than not, need to place the tongs down on the work surface whilst you leave the cooking to continue. You can get hold of small resting plates or just a normal plate which you can use alone, but sometimes, if the food you are preparing is not very “drippy”, then it’s handy to be able to just put the tongs down whilst you don’t need them, no requirement to go round hunting for your plate or dish. Now you want to keep them clean still, and also you want to keep your work surfaces clean, so even if there is no fat dripping from them from the burgers, they are best left somehow not touching anything – here is where the built in stand comes into play. 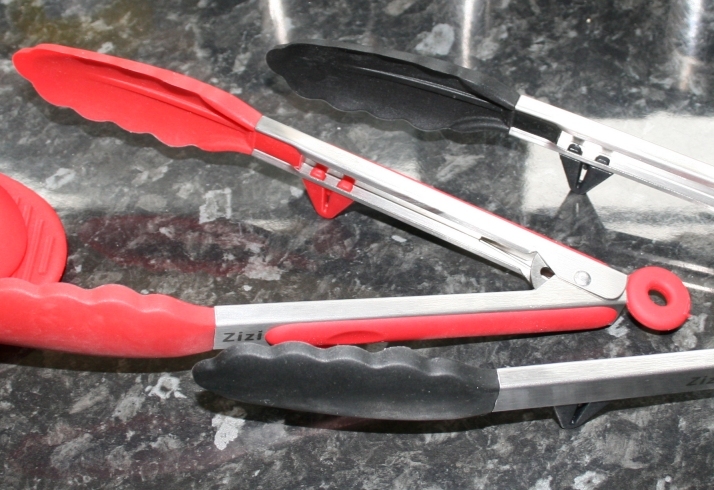 Above, you can see that each of the pairs of tongs has stands built onto the handle – there are actually four stands in total on two pairs of tongs but I am showing one arm of each for the clarity of the zoom. See how when placed the right way up, the tongs rest on your kitchen work surface without the grippers actually touching the top! Fantastic idea! 2. Fold Away Tongs Feature. Most kitchen drawers are segregated with partitions which are not very wide – certainly not wide enough to accommodate a pair of unfolded tongs. Nothing infuriates me more than a pair of opened tongs taking up all the room and getting in the way of other utensils in my kitchen drawer! Problem solved, these have a feature of a small ring on the end. When the tongs are closed, you simply pull on the ring and it locks them in the shut position. this way they are more than halved in width and fit neatly into the kitchen draw. See below. The rubber on the handles means comfort. Cold hard metal is used to make them, this gives good strength and durability, but that added bit of rubber down each side of the handle gives ergonomic comfort – in particular where you need to apply a fair amount of pressure to squeeze the tongs onto the food you are turning over. I have metal headed tongs and also rubber ones. Each type has it’s merits. For example, the metal ones with no rubber on the ends where the food is pinched can be held over heat for a longer period of time, this is ideal for a BBQ, but not a requirement when grill cooking in the kitchen. This is because you can take the food away from the source of the heat whilst you turn it when using a cooker grill within a typical range or standard oven. Whereas on a BBQ, you rotate the food directly above the heat and in some cases on larger BBQ’s, you may have the tongs over very high temperatures for quite a while if you are serving party guests and have a lot of sausages or chops cooking at the same time. So horses for courses, but when using the rubber ones, as shown below, a little bit of flexibility in the heads can allow them to shape around the food and grip it just that little bit firmer to prevent it from slipping out and dropping to the floor. Personally I would like to see some horizontal grips in there for extra grabbing power! Now the little mitt which you can see in the top picture is perfect for retrieving pizzas from a grille inside a very small portable oven I have. The normal oven gloves are just too slippy and long – they get in the way. With this small mitt I am able to reach down into the glass oven and lift the pizza out by grabbing the chrome grill and bringing it out all in one go.